Watch YNU Group Inc Archives of Older Product Videos by TDmonthly. Mixis™ collectible play dolls - Sunshine collection have been delicately designed with varying skin tones, realistically painted eyes, unique facial characteristics, fully articulated arms and legs and a naturally proportioned body. The focus is on the blending and fusion of races, ethnicities and cultures, encouraging a dialogue between children and their families that explores the richness and diversity of their individual backgrounds. "The Mixis dolls all have a nice weight in your hand; they have substance. The packages can double as storage for the dolls. The dolls are NOT excessively bound to the box - remove them by untying some ribbons and loosening the paper holding the dolls' hair." 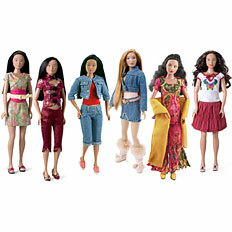 "The Mixis dolls can wear some Barbie and other 11.5-12" doll fashions EXCEPT for pants. The Mixis build is fuller and rounder than standard fashion dolls." "Rosa has lovely, strong features. Blue eyes nicely contrast her tawny coloring. She has a substantial look and weight. So parents offended by the traditional big bust, small waist, thin legs of many fashion dolls might find Rosa less offensive." Mixis™ Website is dedicated to the journey of the Mixis™ friends, their world travels and self-discovery. Mixis™ Culturally Inspired Clothing draws on influences from China, Japan, India and Central and North American. Each outfit is inspired, not only by traditional and historical costume but also from current fashion trends.